Great for family of 4 and a family pet. This home is a great spot for relaxation, and to get away from it all. It has been beautifully remodeled with modern lighting, hard wood floors and ceilings, slate tiled gas fireplace, concrete kitchen counters and updated baths. The large partly shady/partly sunny deck is perfect for lounging or entertaining for a group. The home is located in the Meyers area, with easy access to the Pacific Rim trail for amazing day hikes–and 1.5 miles from the Corral Area Mountain Bike trails. The hustle-bustle of State-line and the casinos are several miles away, providing the privacy and quiet you are looking for in South Lake Tahoe—but with easy access to night life when you want it. The upstairs master suite includes a queen bed beneath skylights, down comforter/duvet, and private bath that has been tastefully updated. This bedroom is completely private and can be shut off from the downstairs, to watch the 32′ HDTV (with DVD) or enjoy the sky view overhead. The downstairs bedroom has a king bed with down comforter/duvet, and futon sofa that can be used as a double bed. The downstairs bath has also been tastefully updated with beautiful wood ceiling, marble counter tops, modern fixtures, soft lighting, and new tile shower with massage jets and a heavy glass enclosure. Each bedroom includes quality bed linens, pillows and extra blankets. The bathrooms include towels, bath mat, hair dryer, bar soap and shampoo. The kitchen is super functional, with concrete counter tops, hard wood floors, and new appliances. The kitchen has a small bar with 2 bar stools, modern lighting, and is open to the living room and dining room, for great conversation while preparing meals. The dining room table has seating for 6. It is stocked with enough place settings for 8, and all necessary cooking appliances and utensils. There are basic supplies such as spices and foil for your use. The living room is the perfect place to kick back on the comfy sofa in front of the fireplace and watch TV or movies. In addition to the sofa, there are 2 side chairs plus pillows for the hearth. The home has Wi-Fi, plus an A/V system that includes a 32′ HDTV, Charter digital cable and DVD player. There is an extra HDMI port for Roku, Apple TV, game systems and a 3.5mm input to connect iPods, iPhones or other mobile devices that you may travel with. This getaway includes a beautiful, large deck perfect for summer lounging, gathering with family and friends, and BBQing. The home includes a gas grill, large patio table with seating for 6 and two adirondack chairs. For evening entertainment indoors, there are 2 HDTVs, games and a game table in the upstairs bedroom. For the outdoor enthusiast, this home is in a great location, with easy access to hiking and mountain biking, river rafting and golf. The Tahoe to Yosemite Trail (TYT) and Pacific Crest Trails (PCT) are easily accessible from the home and are the main Tahoe trailheads for backpacking south to Mount Whitney. A 5.5 mile hike to Meiss Cabin is where the PCT and TYT routes join. The Big Meadow north and south trailheads are less than 5 miles from the home. The South Upper Truckee Road Trailhead is located at the end of the South Upper Truckee Road in Meyers. It is a paved road to the trailhead and is maintained year-round. The unofficial hub of mountain bike activity in South Shore is just 1.5 miles out the back door. This area has a high density of trails for all ability levels, and will keep almost anyone interested for hours. You will find everyone out there having fun, from people in body armor and downhill bikes to families with kids, to XC racers riding intervals. During the summer, depending on the water level, there is rafting on the South Upper Truckee river. As the Upper Truckee flows towards the lake, it becomes more gentle. The river flows through the Lake Tahoe Golf Course, and often you will see tubing on the river there. Points for entry include the Highway 50 bridge near South Upper Truckee Blvd, and the Highway 50 bridge at Sawmill Road. Fun and comfort await you from the moment you walk through the door. Your own boat dock, pool table, hot tub, sauna, steam bath, waterfront decks, 2huge HD entertainment systems, the list goes on and on. Water-front living with room for the whole family. This bright, stylish and modern five bedroom home is ready and waiting for your next family adventure! Picture it now – cool evenings out on the deck, ending a full day of skiing with a soak in your private hot tub, soothing the muscles in the sauna or the steam shower, and wrapping it all up with a family pool or foosball tournament or lounging by the waterfront conversation-pit on the deck. This 5 bedroom/4 bathroom home features ground floor living with two of the five bedrooms downstairs (along with two bathrooms). There are three bedrooms upstairs with the other two bathrooms. This home will comfortably sleep 14 guests, with a maximum of 8 adults. With two master bedrooms, this home is ideal for families and reunions. The living room features a 55-inch flat screen TV with cable and a DVD player plus an easy-on fireplace for warmth and ambiance. You even have an Apple TV for Netflix, iTunes, viewing your own photos, and more. The formal dining room table seats 10 comfortably, and there is additional seating at the breakfast bar. The cooks in your groups will delight in the large, open kitchen. Two bedrooms downstairs include the master bedroom with a king sized bed, flat screen TV, and an en suite full bathroom. The sliding glass door look out over the waterway and leads and opens the deck and hot tub. The second downstairs bedroom features two full beds and its own flatscreen TV. great for kids or even two couples. Plus, the full bathroom downstairs features a steam shower! and is right next to the sauna that can fit up to four people. The game room awaits at the top of the stairs. Complete with a regulation pool table, craps/roulette/blackjack table, 50-inch flat screen TV, gas fireplace, and plenty of seating. Fun in Tahoe year-round. There is even a ping pong table in the garage and foosball downstairs. Each of three upstairs bedrooms have their own flat screen TV. A second master bedroom is upstairs with a king sized bed and private bathroom. The second upstairs bedroom has a queen sized bed, and the third has two queens beds. The second full bathroom upstairs is convenient to the game room and all bedrooms. Bring your boat! Dock it right outside the living room and catch the early morning glass on the lake. This unique location in the Tahoe Keys community is perfect for water sports fans. In only a couple of minutes, you’ll cruising or skiing the crystal clear waters of Lake Tahoe! The Tahoe Keys development also offers a year-round indoor lap pool, seasonal outdoor pool, shared hot tubs, and tennis courts for a daily or weekly fee. Please inquire at the clubhouse. South Lake Tahoe is definitely a year-round destination and in winter, world-class skiing is less than six miles away at Heavenly Mountain Resort. Spend the day skiing, snowboarding, and more, all against the spectacular backdrop of snowy, scenic Lake Tahoe. 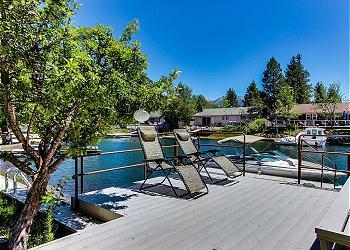 This waterfront Tahoe Keys home will be your ideal home-base for your winter or summer adventure! If you’re looking for more than a forgettable hotel room to spend some time in on your vacation, it’s time to consider a vacation rental. Often times a home rental can provide some of the most spectacular experiences in South Lake Tahoe, something the plethora of casino hotels and tiny motels cannot do. When planning your next getaway to South Lake Tahoe, consider these top ten reasons why a vacation rental is the best option for you! More Space – Lets face it, hotel rooms aren’t designed to be fully functional for families of four, nor are they built for sprawling out and relaxing. Hotel rooms average about 400 square feet while the average vacation home is roughly 2,000 square feet. That’s 5 TIMES the space! Keeping family together – Our vacation rentals can often sleep any number of people from 2 to 20 we’ve got a home for you. Not only does this allow all your friends and family to be under one roof together, but mom and dad don’t have to share with the kids! Additionally, cost splitting between multiple guests keeps the cost per person low. Even More Savings – RnR Vacation rentals are equipped with all you need to prepare your own meals and in some cases boast gourmet chef’s kitchens. Cooking your own meals for even just some of the time will alleviate some of the tremendous costs associated with eating out. Plus you keep those picky eaters and special dieters happy and healthy! Wardrobe Changes – Our South Lake Tahoe homes have laundry rooms with washers and dryers. Go ahead and get dirty, in home laundry allows you avoid unneccessary dry cleaning or clothing purchases. Mad Entertainment – RnR Vacation Rentals are equipped with TV’s, DVD players, movies, and some include video games and pool tables! Never experience a dull moment in an RnR home, whether you’re relaxing at the house for a day or need to unwind, everyone will be entertained 100% of the time. FREE Parking – Driveways and car ports come standard with a vacation rentals. While hotel parking can get expensive quickly, each of our homes has free parking for multiple vehicles for you to use the entire duration of your stay. Views Included – weather you are looking for a lakefront home, gorgeous moutain views, or secluded cottage nestled away from it all, RnR Vacation Rentals has what you are looking for in South Lake Tahoe. Never request a lakeview room again and no need to upgrade for the balcony – all your requests can be found within the right home for you! Ultimate Privacy – renting your own home means no running into staff or other guests, private hot tub use in all of our homes, and blissful privacy during your entire vacation. South Lake is an awesome place to relax, leave you worries behind and step into an RnR Vacation rental to get away from it all. Get Married – As one of the top destination wedding spots, our South Lake Tahoe homes offer a wonderful spot to gather or great option for wedding guests to stay together and save on hotel room costs. Quality and Customer Service – RnR Vacation Rentals have top of the lin sheets, updated and upgraded homes and many other perks. The beauty of our homes is that we are there to help with anything at all, if and when you need it. Enjoy the privacy of a private home, but need something from us and we’re on it! Like we said last month, as the warm weather encroaches on South Lake Tahoe, the events get better than before! March was fantastic and this month South Lake Tahoe has some real treats for you! The Fabulous Thunderbirds – the quintessential American band. With his storytelling wit and wisdom, coupled with a mastery of an array of stringed instruments, Taj will present a rare solo acoustic performance. Dennis Edwards, David Sea, Mike Pattillo, Chris Arnold and the son of original Temptation Paul Williams Jr.